I had a pork cooking marathon this weekend, leading to some tasty revelations. First up in the pork series is the pork salad I always wanted to make at home. 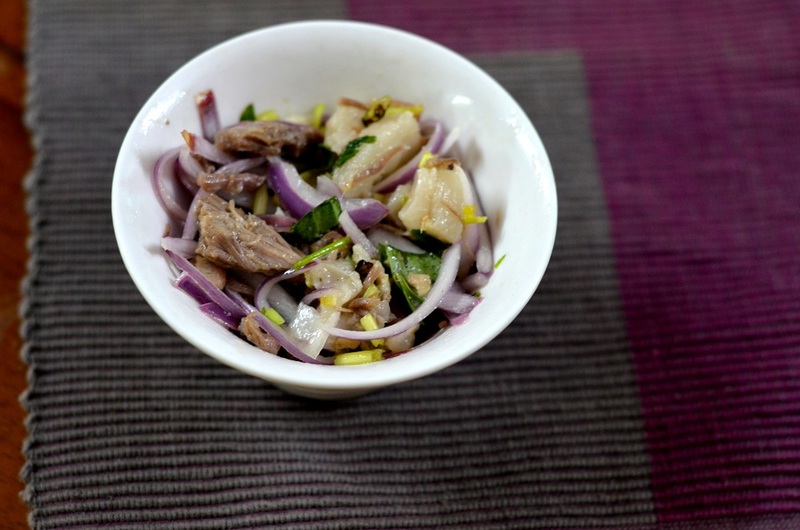 Always loved the idea of antithesis pairings such as pork with salad ingredients – and they do it so efficiently in the North East India and South East Asian countries. This salad is collectively inspired by the Dohjem or pork offal salad from Meghalaya, the Pork bharta from Tripura,Vietnamese pork salad and Thai laab, knowing how beautifully the key flavouring ingredients would complement each other. Pressure cook the meat if using raw. I was originally making a curry so I kept aside some of the pressure cooked meat for making the salad. Leave aside for a while, cool and serve alongside any rice base dish. Tip: There are variations one could try, for example adding a little sugar or honey, toasted nuts, roasted and ground schezwan peppers etc for seasoning.